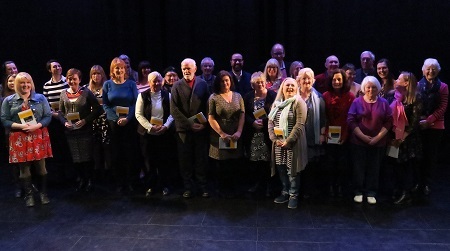 Over 100 people attended the launch of an anthology of short stories written by new writers. The anthology was the result of the Write Time, Write Place creative writing course for beginners, which ran during autumn 2017 in four local libraries across Cheshire West and Chester: Storyhouse, Chester; Ellesmere Port; Northwich and Winsford. More than 50 people attended the eight-week course and took part in workshops looking at topics such as setting the scene, building a character, using dialogue and designing a plot with the outcome to write their own short story. The course was funded mainly by Arts Council England with support from Cheshire West and Chester libraries and Storyhouse, Chester and was run by Charlie Lea from the literacy company ‘Read Now Write Now’. The anthology includes stories for children including one about animals who live close to a canal; supernatural tales of a park and also of a train journey at Christmas, stories set in a myriad of places and times: World War One; Vienna in the 1930s; Aberwennol Bay, Wales together with tales set in the twentieth first century concerning twentieth first century issues. At the launch, the workshop leader, Charlie Lea, gave a short speech to the writers, friends and family and the public before some of the new authors read extracts from their stories. Workshop leader, Charlie Lea said: “It was such a pleasure to run this course of creative writing in Cheshire West, meeting like-minded people and listening and sharing their ideas for stories. Alan Carr, one of the authors, said: “"The series of eight workshops proved a wonderfully creative and enjoyable way to spend time and exchange ideas with other aspiring writers. We were all sad when it came to an end and are hoping to set up our own weekly creative writing group so that we can build on the progress that we have made. “It’s amazing to think that the apprehensive group who turned up for the first workshop in November should have found themselves as contributors to a printed short story anthology just a few weeks later. The confidence that we gained from this project was clear for all to see at the book launch at Storyhouse in Chester. We all intend to continue writing."